Classes cost £8 (£5 full-time students & concessions)* for one class + dancing afterwards. of £1 on most days - and £2.50 (£1.50 full-time students & concessions)* on Tuesdays at RISC. 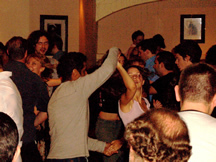 We are very confident that you will find learning Salsa with us to be fun and fulfilling, as we put a lot of effort into ensuring this is the case. However, if you are dissatisfied in any way with any of our classes, we really do want to know, so that we can both make any improvements necessary and also make amends to you by refunding your money for that class (with no quibbles whatsoever). * Please bring proof that you are a FULL-TIME student or proof of benefits to claim the reduced rate.